In addition to starting my own book tour company, Bewitching Book Tours, I decided to add another job to my resume when an opportunity came my way last week. 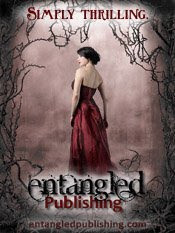 I am now one of the book publicists for the new publishing company Entangled Publishing. I am really excited to be involved in this new venture and look forward to getting started. The company officially launches their books in August. Currently they are acquiring authors, books, and staff members. So authors if you're looking for a publisher you should check out Entangled.